The new Playbase home theater speaker from Sonos is slim but packs a punch. As TVs get flatter, their sound gets worse. Enter Sonos’ latest home theater speaker, the $699 Playbase, a thin and flat home theater/streaming music system designed to sit underneath your TV. 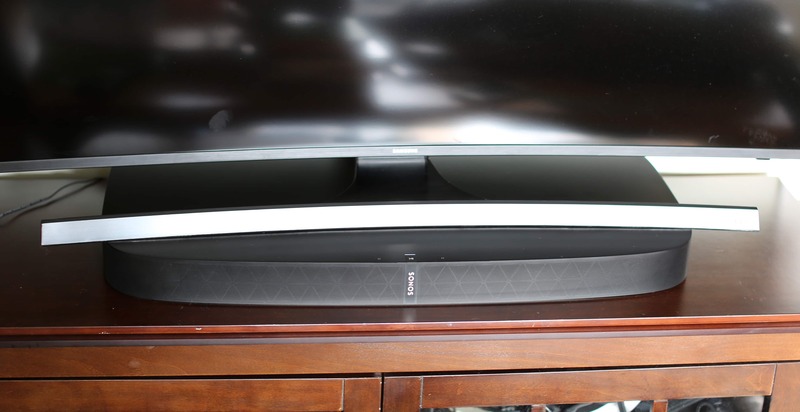 Like the TV above it, the Playbase is thin, but it packs a significant punch. Resembling a pizza box with rounded corners, it features 10 speakers, including a muscular built-in subwoofer, and it can make quite a noise. In fact, it sounds fantastic. The Playbase is louder and punchier than Sonos’ current home-theater speaker, the Playbar, and a lot more unobtrusive. You don’t really notice it’s there, until it starts shaking the room. The Playbase is Sonos’ thinnest speaker yet. It’s the first major new product in 18 months from the company, which has seen some layoffs and management shakeups recently. Available in both black and white, the Playbase ships worldwide today. 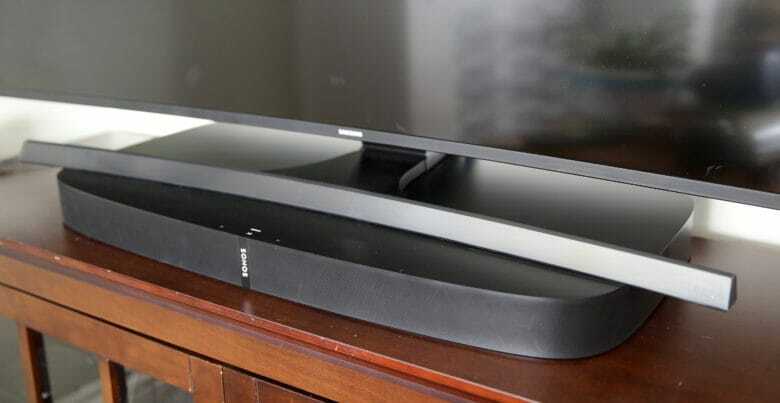 It costs a hefty $699, which is two or three times more than rival home theater soundbars. But for that you get Sonos’ great sound quality and unparalleled ease of use. This is by far one of the easiest soundbars to set up and use. It’s also as much a streaming music speaker as a home theater component. It’s a living room stereo, capable of playing music loudly and clearly from dozens of streaming music services. And it connects to other Sonos speakers throughout the house. Prior to testing the Playbase for this review, we had Sonos’ previous home theater speaker — the Playbar — parked in front of our TV. I’m a big fan of the Playbar. Paired with a Sonos Subwoofer ($699), and a pair of Play:1 satellite speakers ($199 apiece), it’s the centerpiece of an expensive but utterly great home theater system. It’s great for TV, but I really enjoy it for playing music. It’s loud and full-throated. It rattles the windows and I love it. Whatever the application, it always sounds fantastic. The Playbar is designed to be mounted on the wall, below a wall-mounted TV. But in customer research, Sonos discovered that up to 70 percent of all TVs don’t get mounted at all, but instead sit on a piece of furniture. Playbar owners tend to place their speaker awkwardly in front of their TVs. That seemed like an opportunity to Sonos — to design a speaker that better integrates with TVs sitting on a stand. 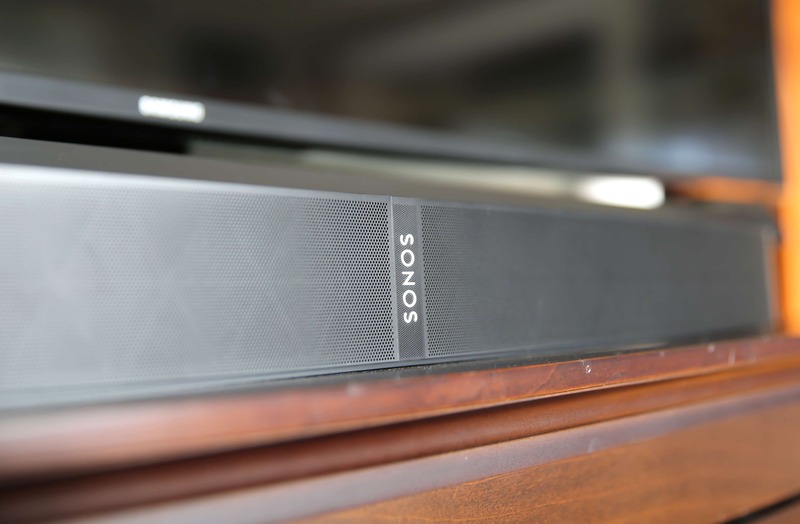 Sonos says it’s not replacing the Playbar with the Playbase. Rather, they complement one another. 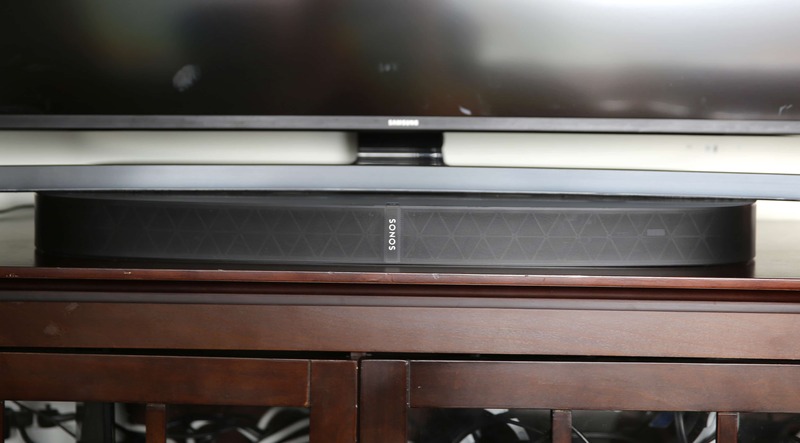 The Playbar is best for mounting on a wall, while the Playbase is for putting underneath your TV. With its distinctive grill, the Playbase looks like one of Sonos’ regular speakers that’s been put in a press and squashed flat. Even the grill was carefully designed. Its 43,000 holes are actually different sizes — smaller at the front than the sides — to make it acoustically transparent. Measuring just 2.3 inches high, the Playbase is designed to support big flatscreen TVs weighing up to 77 pounds, which Sonos says covers almost every TV. It’s heavy, solid and made to last. The casing is made of hardened, glass-infused polycarbonate that Sonos says will easily last a decade without breaking or discoloring. The Playbase is designed to keep vibration to a minimum. You’ll hear no rattles, even with the volume all the way up. Controls are minimal, too. You’ll find only touch-sensitive buttons for play/pause, volume up and down, and swiping previous/next track. Likewise, Playbase comes with just two cords: one for power, the other for digital audio from the TV. Inside, Sonos packed 10 speakers — six midrange speakers, three tweeters and one woofer. Because the Playbase is flat, the woofer is mounted horizontally. It fires downward, but the air it displaces gets pushed through a snaking, S-shaped tube inside. It’s surprisingly effective. The Playbase sounds much more muscular than the Playbar in a head-to-head test. The Playbase is almost over-engineered. It’s designed to support TVs weighing up to 77lbs, and will last a good ten years, Sonos says. Once plugged in, setup is dead easy. The Sonos app guides you through pairing (press a button on the side) and adding components like satellites, a subwoofer and your TV remote. It’s an easy, five-minute process. You then tune the system’s acoustics to your living room using Sonos’ TruePlay — software that tweaks the speakers to the acoustical properties of the room. Cleverly, the Playbase can recognize when the speaker is playing sound from the TV, and tweaks its speakers for listening on the couch. When playing music, the speakers get optimized for the whole room. So how does the Playbase sound? The Playbase sounds a lot better than it looks like it should. To be honest, from the outside, it doesn’t look like a great-sounding speaker. It’s too … flat. But it sounds absolutely fandabbydozy. The soundstage is wide, and there’s clear stereo separation that sounds much wider than the speaker itself. At low volumes, the sound is clear, sharp and natural, but you can still feel the low end. Turned up, the Playbase pumps out clear, balanced sound with strong bass, midrange and treble. It’s balanced and natural. The bass is strong and room-filling. When turned up loud, it positively rumbles, but doesn’t drown out the higher frequencies. It sounds even better paired with Sonos’ separate subwoofer and a pair of satellites to create a 5.1 surround sound system. However, in a head-to-head with the older Playbar, I turned off the subwoofer and satellites so it was just mano-a-mano — Playbase versus Playbar. For the test, I played several music tracks and could hear the difference. I always thought the Playbar was a fantastic speaker, but the Playbase is better. It’s richer and louder, thanks to the built-in woofer. Everything is balanced and clear, but the Playbase boasts a rich, deep bass that really delivers a punch. Head to head, the Playbase sounds better. Controls are minimal. There’s only touch-sensitive buttons for play/pause, volume up and down, and swiping previous/next track. The Sonos app is still as clunky as ever, with non-intuitive controls and sucky search. Simple things like finding and playing podcasts is nigh impossible. Its integration with Apple Music is pretty horrible, but services like TuneIn radio are adequate. Luckily, the system can be controlled directly through the Spotify app, which lessens some of the pain. Sonos limited the Playbase to use only Dolby Digital for surround sound. It doesn’t support DTS multichannel audio, which is standard on physical media like DVD, Blu-ray and Laserdisc. Sonos explained that it is focused on “modern listeners who predominantly stream,” noting that video streaming services like Netflix and Hulu don’t support DTS. Another thing to note is that the only input option is optical. There’s no HDMI or analog input. That’s fine for most modern TVs, especially if you route all your home theater components — cable box, DVD player, Playstation, Xbox and so on — through the TV. One digital audio port is all you’ll need. Oddly, the company says the new Playbase will be compatible later this year with Amazon’s smart voice assistant, Alexa. However, the Playbase doesn’t include any microphones to listen for voice commands. It’s an odd omission. The company said voice services like Alexa are the most important development in home audio and made promises last year to support Alexa in future products. Likewise, the press materials for Playbase claim the speaker will be Alexa-compatible later this year. But the absence of microphones implies it will need to be hooked to an external Alexa-enabled device like Amazon’s Echo Dot. I gotta admit, I’m not a huge fan of the Playbase’s design. It’s not very attractive. But who cares? It sounds a lot better than it looks. I’m a fan. Sonos’ speakers are expensive, but it’s worth it. They last a long time and deliver good value. When Sonos says Playbase will last 10 years, I believe it. Sonos’ reputation for great sound and ease of use is upheld. The company’s fanatical attention to detail is manifest in its latest speaker — and it sounds great. Sonos provided Cult of Mac with a review unit for this article. Check out more Best List reviews. Read Cult of Mac’s reviews policy.